Auburn Hills, Mich. , Aug 1, 2011 - The FIAT® brand announced today the launch of an all-new marketing and advertising campaign, the first since its return to the North American market. The comprehensive campaign combines broadcast, print, digital and experiential initiatives and will be focused in the brand’s key markets together with complementary national advertising efforts. The introduction of a new tagline, “Simply More,” sets the tone for the campaign. The brand’s first national television commercial, “Drive-in,” is scheduled to air on Monday, Aug. 1, on national and cable networks. 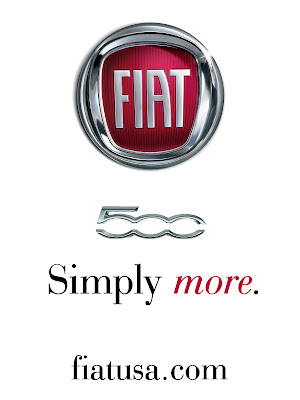 The FIAT brand’s new tagline, “Simply More,” defines the Fiat 500 as everything you need and nothing you don’t. It represents the notion that the simple things in life are treasures, alongside the thought that the richness and fullness of a life well-lived is defined by one’s view of self-expression. The advertising campaign kicks off with its first broadcast commercial, titled “Drive-in,” which debuts on national and cable networks today and features “Jailhouse Rock,” a song made famous by Elvis Presley. The song was an instant classic and inspired a generation; it was released in 1957, the same year as the introduction of the Fiat 500 in Europe. 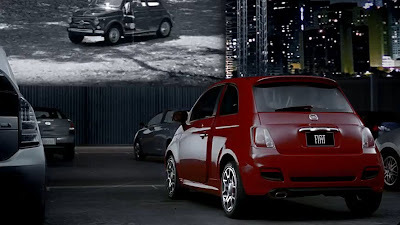 The 30-second television commercial is a perfect juxtaposition of brand heritage and today’s Fiat 500. “Drive-in” introduces the concept of how compact vehicles can be strong, beautiful and simple. • Bigger isn’t better. It’s just harder to park. • Life’s newest simple pleasure. • 139.6 inches. Every one tells a story. • On a scale from 1 to 10, it’s a 500. 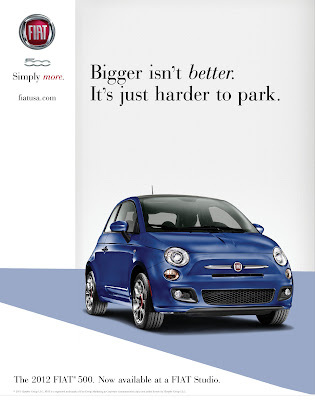 The brand’s web site (www.FiatUSA.com) is designed to welcome consumers and envelop them in the full brand experience whether it’s building a vehicle, locating a FIAT Studio or browsing through its collection of merchandise and accessories to meet their lifestyle. 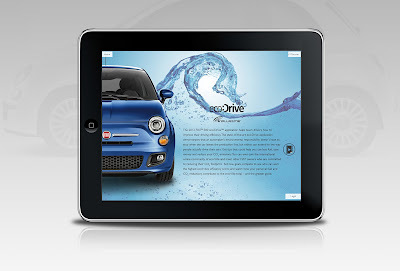 Recently, the brand launched the “FIAT Source” touch-based application for the iPad. The new app digitally showcases the new 2012 Fiat 500 vehicle line and is free to the public to download from iTunes. The premiere Art & Design issue features a gallery installment of four talented emerging artists that, like the FIAT brand, celebrate modern art, technology and design revival. Designed to stay fresh, FIAT Source will feature additional chapters, new consumer lifestyle stories and iPad-specific interaction – such as a historical design timeline of the iconic Fiat 500 vehicle. 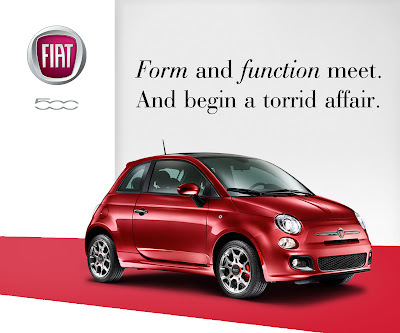 Scheduled to renew quarterly, FIAT Source issues will include music, entertainment, fashion, travel and art. The FIAT brand has celebrated its return to the North American market through various experiential events such as the award-winning FIAT Gallery in New York, Exhibitalia in Miami, FADER FORT by FIAT in Texas, and the “FIAT Freak Out” Enthusiast Event in Nashville, Tenn.
“Events and partnerships will continue to play an integral role as they allow us to connect one-on-one with our core FIAT fans and develop a relationship with those who may be new to the brand,” said Soave. 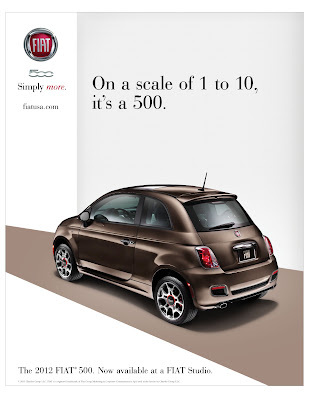 Creative efforts were developed by Impatto, based in Southfield, Mich., the FIAT brand’s lead advertising agency. This campaign looks quite good and I love the print ads, simple and elegant with a splash of color in the car's 14 colors, one of them for each ad, nice. In a way, it looks like they took a semi page out of the classic VW Beetle ads of the 60's. It'll be interesting to see this ad campaign unfold and the reactions it elicits. I wish I can have the print ad with my 500's color. Where can I get one? In this ad campaign, ad agency IMPATTO creatively uses Elvis to bridge an American icon with an Italian one. Elvis and the Fiat 500, along with the drive-in movie theater scenery gives the brand some character, but also shows how elegant the car is. Overall, IMPATTO takes a classic, strategic approach to adapt Italian culture in America to reach out to their new US customers. The print ads are sleek and fashionable, as well as cleverly written.